Taurus G2C Black 9mm 2mags 1-G2C931-12. 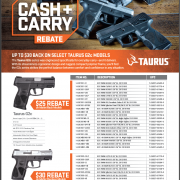 $25 Rebate – Ellis County Firearms – Waxahachie, TX. Taurus G2C black 9mm 2mags. $25.00 back via Rebate. Taurus G2C, black (1-G2C931-12), Chambered in 9mm. This firearm is new in box with all paperwork & made in Brazil! Has 3.2″ barrel, Black polymer frame, Black steel slide, Black polymer grips, 2 – 12rd mags, Three Dot Adjustable sights, manual safety, Loaded chamber indicator, single slot accessory rail, Double Action Only & weighs 20.8oz. 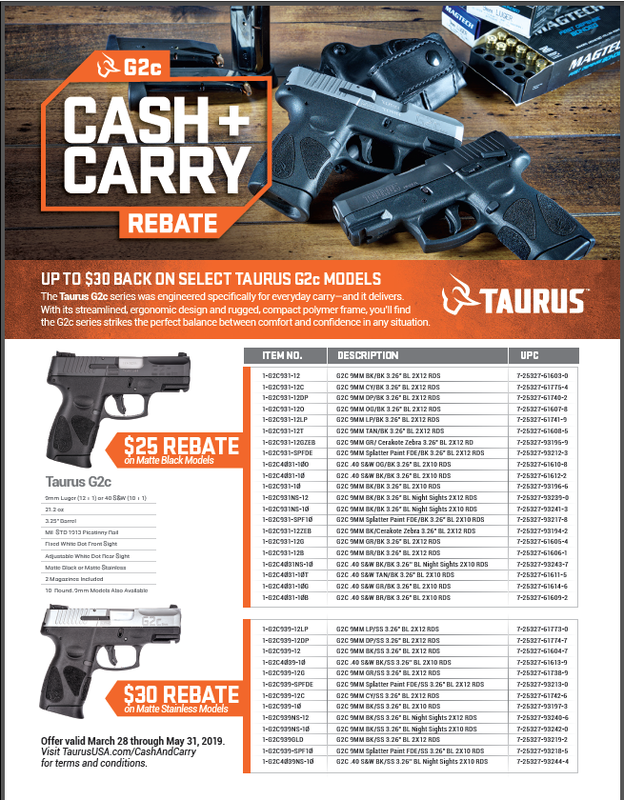 From March 28th through May 31st 2019, buy a Taurus G2C and receive upto $30.00 back via rebate. Get 25.00 back on G2C with black slide and 30.00 back on G2C with Stainless slide. We will provide a receipt so you be able to get your rebate. Shipping USPS Priority Mail is $13.00. Shipping is 13.00 Via USPS priority mail w/ signature confirmation. Alaska, Hawaii, Puerto Rico, or Guam add 2.00 (handguns only). Insurance is available upon request (1.45 per 100). Ellis County Firearms will not be responsible for damaged or lost packages if insurance is not purchased! We will reduce shipping on multiple items purchased if we can ship in same box. We accept USPS postal money orders. Personal check (held 7 days till it clears our bank). Visa, MasterCard & Discover (add 2.5%). If paying with Visa, MasterCard or Discover call us at 469-552-6487 to pay. Listed price is the cash price! Cash discount lost when paying with credit card. Add 2.5% for Credit Cards. Please note, non USPS postal money orders and cashier’s checks will be treated like personal checks. This is due to past fraud. Make sure you can legally own this firearm in your state. Item must ship to an FFL holder of your choice!!!! Dealers License (FFL) can be emailed to ffl@elliscountyfirearms.com or faxed to 800-580-8711. Please reference your name or firearm purchased, so we will know who it’s for. NOTE: We must have a physical copy of the Dealer’s license (FFL) emailed, faxed or snail mailed to us before we can ship! Warranties are handled by the manufacturer. If work is needed we can assist you to make contact with manufacturer. Texas residents: tax is assessed (6.25%). California residents: We are happy to ship to California! You are responsible to make sure the firearm is on the California DOJ list! This firearm is in stock and ready to ship (once payment and FFL received). Your firearm will ship within 24hrs of receiving payment and FFL. We will provide you with a tracking #, via email. All firearms shipped will require a signature! Mailing in payment? We will call or email letting you know payment arrival and shipping details. You will receive firearm described but serial # may differ from photo. We order multiples of the same gun. This firearm is factory new with manufactures warranty. Firearms for sale on the internet are not on display. You will receive a untouched weapon from Ellis Firearms. Thank you for looking. We have other great items that may interest you. Please check out the rest of our site. FN FNX45 Tactical FDE Night sight 45acp 3mags 66968 Rebate.